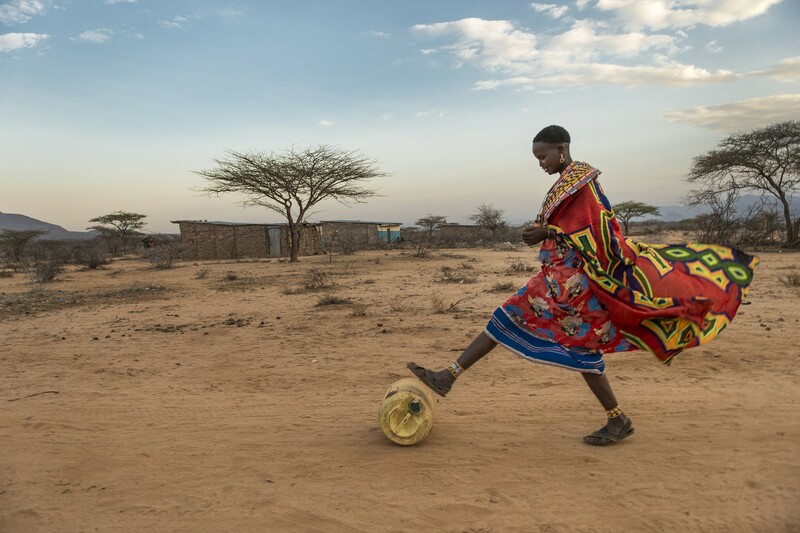 Naitemu Letur pushes a jug of water back to her manyatta. Traditionally, women like Letur, who is a Maa-speaking Samburu were pastoralists, whose livelihoods have traditionally been rooted in semi nomadic cattle, goat and sheep farming across the rangelands of northern Kenya. But as changing times bring increased pressure on natural resources, grazing cattle has become a volatile livelihood, as unpredictable drought and competition with protected wildlife for grazing becomes more frequent. Now she is able to sell her livestock to a market created by NRT. The Northern Rangelands Trust's mission is to develop resilient community conservancies in Northern Kenya which transform people’s lives, secure peace and conserve natural resources.